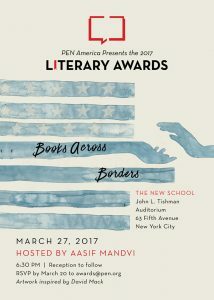 PEN America will host the 2017 PEN America Literary Awards Ceremony hosted by comedian, writer, and actor Aasif Mandvi on March 27 in partnership with The New School’s Creative Writing Program. The ceremony is invitation-only and a ticketed reception will follow. The winners for this year’s awards can be found here. Winners of the PEN/Jean Stein Book Award, PEN/Nabokov Award for Achievement in International Literature, PEN/Robert W. Bingham Prize for Debut Fiction, and PEN/Diamonstein-Spielvogel Award for the Art of the Essay will be announced live at the ceremony. Given the themes of migration, social justice, and tolerance that permeate this year’s award-winning works, the ceremony will focus on the power of books to foster dialogue between communities. Under the title “The 2017 PEN America Literary Awards Ceremony: Books Across Borders,” the evening event will spotlight international and immigrant experiences that infuse and inspire American literature. The 2017 PEN America Literary Awards will be the biggest yet, conferring 23 distinct awards, fellowships, grants, and prizes totaling nearly $315,000 across a broad range of categories including fiction, nonfiction, poetry, playwriting, translation, and more. PEN gratefully acknowledges Bauman Rare Books and The New School’s Creative Writing Program for their generosity and hospitality.